Our nine month picture didn't turn out quite as planned, because Fuzzy wouldn't cooperate no matter what we tried. However, I think the collage nicely captures the process. This month had a lot of language-related milestones. Not that Fuzzy's talking, per se, but we've had some interesting noises being made. 1) At the beginning of February, he started waggling his tongue in in his mouth, and making an adorable burbling noise - "blableablealala." Mostly this was happening when we changed his diaper, but occasionally he would let loose with it when running around in his walker or while playing down in the basement. I wish this phase had lasted longer, because I could listen to him burble like that all day. 2) Then, about five days after the the burbling started, I noticed that he would crawl around, and whisper something very very softly to himself. If I listened in close, it sounded like "da da da." He wouldn't say it at anything approaching normal volume, but eventually we figured out that it was indeed a "da" sound. After a few days, it morphed into a "die die die" noise, which was particularly amusing as he muttered it to himself while crawling toward one of us. Eventually he started saying it somewhat louder, both as "da" and as "die," but almost a month later, his preferred method is still the whisper. 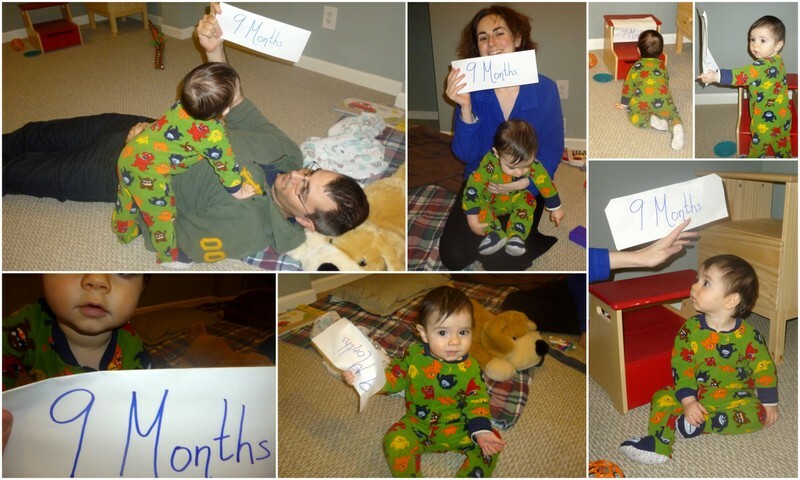 3) At nine months, he now makes three distinct noises - "da," "na," and "arggggh." If we say these things to him, we can usually get him to say them back. The Pit is convinced he's taught Fuzzy how to make a "la" noise too, but as I've never been able to get him to say it, I'm dubious. Despite multiple entreaties, "ma" is still not on the menu. 4) This isn't strictly speaking a language milestone, but it is mouth-related. About a week ago, he started getting obsessed with his tongue. He sticks it out, then grabs at it with his fingers and folds it up. I'm hoping this will lead to him making some new noises eventually, but so far, it's strictly tactile experimentation. 4) In other non-talking related milestones, Maya and I amused ourselves my testing the baby's memory in an evil way. I had given him the buzzer out of of the Taboo game one evening in desperation, thinking he might enjoy it while I folded laundry. Of course he pressed the button, got the noise, and immediately started crying because it scared him. I told Maya about the incident the next day, and she wanted to know if he remembered the event. We laid the buzzer in the middle of the floor, and he started crawling toward it excitedly. When he got close enough to see it well though, he immediately pulled up short, and started studying it uncertainly from about two feet away. Maya moved it closer to him, and he scuttled over to my legs to get away from it. So, lesson learned - my kid is at least as smart as your typical lab rat. 5) In a similar vein, we figured out he's also very good at remembering positive stimuli. Every night I feed him a baby cereal mixed with milk and a little bit of mushed fruity baby food. One evening, he was being particularly difficult about eating it, and I decided to try for a different texture to distract him. The Pit had bought some tasty-looking strawberries, so I cut one of up teeny tiny and added a piece to each spoonful of cereal. Fuzzy loved it, and we got dinner done in record time. The only issue was that the next day, he absolutely refused to eat the cereal until I cut up more strawberry. There was a great deal of squirming away from the spoon, firmly closed and pursed lips, and arms thrown up to block his face. Then I got the strawberry out, and he was suddenly all cooperative again. Now I have to make sure we always have berries in the house. I suppose it could be worse, at least we're moving into strawberry season.